I like going to garden and plant shows, you always come home with ideas you can apply to your own garden. Not just design ideas but also ways to manage some of the plants you already grow in the garden. 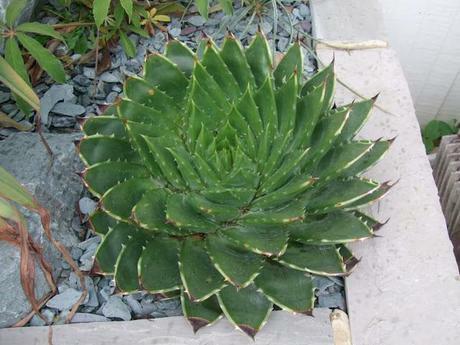 And one good example is how I came about deciding what to do with my spare Aloe polyphylla. We have several already in the garden, two have been planted out since last year and sailed through last winter, another one recently planted, and one waiting in the wings until the construction of the pond pergola has been finished. They are all in the new garden where the raised beds are, an area that receives lots of sun and by the very nature of raised beds, well drained. 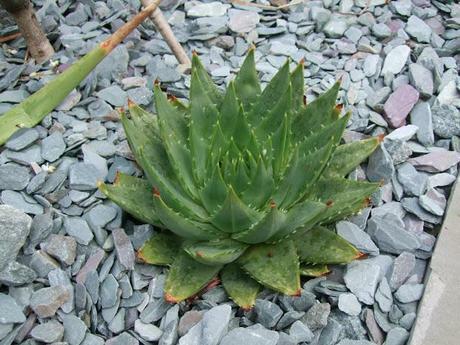 Aloe polyphylla has been fine permanently growing outside in our garden (I have lost one before though, not because of winter but because it got stepped on and crushed to death, long story!!) and sails through the winter unprotected. 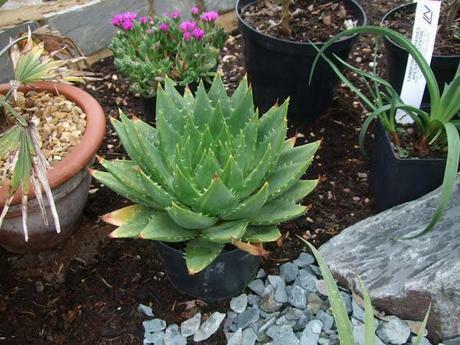 This and a couple more aloes (A. aristata and A. striatula) I find are hardy enough in our garden in most winters. There’s one or two more aloes out there that are potentially hardier than perceived but I have yet to try them myself so I’ll keep mom about them for now. 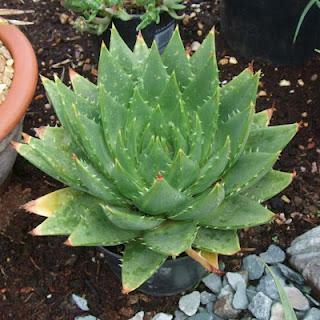 So is this Aloe hardy? Nope, I won’t be brazen enough to say that with conviction. And besides, what is ‘Hardy’ anyway? The definition is much longer and to answer it is a long discussion in its own right. I would say though that this Aloe is one of the few that are worth the gamble on being planted out in the garden. 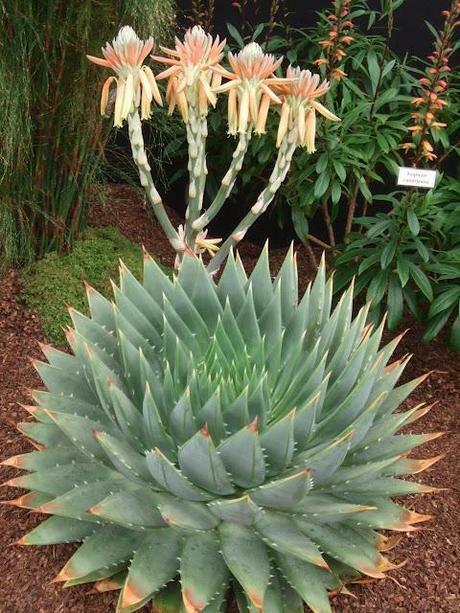 Like all living things there are no hundred percent guarantees but it seems much less riskier than most of the aloes out there. And if you do plant one out, it’s worth siting in the most sheltered spot you can find for it. 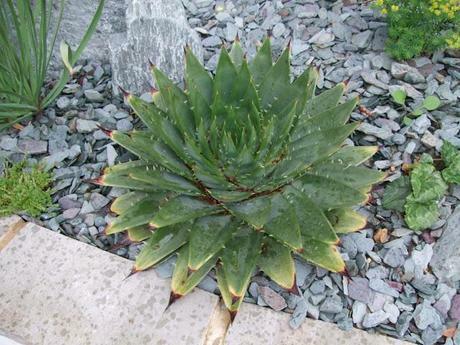 A spot that ideally gets winter sun on a well draining soil that doesn’t dry out too much in the summer as this aloe seems to appreciate a richer soil than most succulents would prefer. Or if such a spot simply doesn’t exist in your garden or your area gets really cold in the winter, you can always grow one in a pot that can be shifted under cover during the winter. One thing I have observed though is how much this aloe loves a free root run and grows so quick if given generous root space. And that’s the main advantage of planting it out where it can root away happily into its surrounding space. Although we have several planted out already, you can never be sure. If possible I always try to have back up plants of most of the ones that get planted out and this is no exception. Having back up plants reassures you that at least you one or two tucked away safely in case the weather gets too adverse and losses are incurred (you always hope you never lose any of course!). The only thing though is I can see how stunted my remaining back up plant already is, kept in the original small pot it came in for years. It’s actually from the same batch as the ones planted out last year the difference in size between them is very obvious. Poor back up aloe, it looks like it is suffering in its small pot!! And then I remembered that show plant Trewidden had in the recently concluded Chelsea Flower Show. It is a huge plant, healthy, pristine, and flowering away despite being in a pot. It was the centrepiece of their gold winning stand and one of the star plants of the show. It’s permanently kept in a pot of course so they can take it with them easily on all the plant shows they participate at. 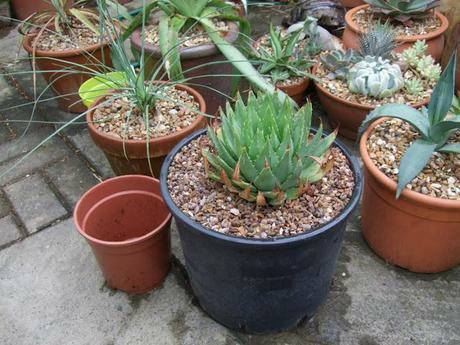 The main difference though is that it is in a large pot hence has a generous root space that keeps their specimen happy. So I thought, why not treat my back up plant the same way? Over pot it and let it relish a bigger root space and hopefully it will become a fantastic specimen too that I can position in the summer anywhere I wish, a lovely mobile display by virtue of being in a pot. 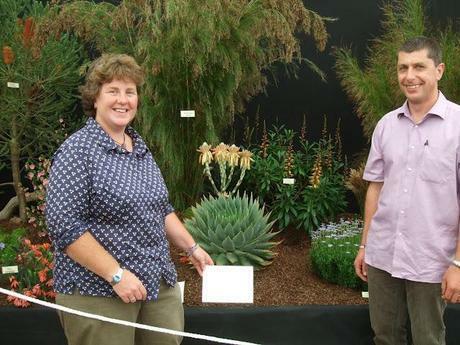 Claire and Jeff posing for us with their well deserved gold medal and their star plant! Two things though: most likely I’ll never plant this one out (large pot=large hole to dig) and will remain in a pot. Second, as it will be under glass in the winter it will be heavier to shift around and will occupy more precious space. I don’t mind, if I get it looking as good as the one Trewidden has then it’s worth the extra effort. And also I feel that I’m giving this plant the long overdue extra attention it needed after suffering in its small pot for a long time. My spare plant re-potted. The original pot to the left compared to it's new pot. This is the same age as our biggest one, that's how stunted it was! This is one of the rare times I severely over pot a plant but I’m hoping the plant will appreciate the extra generous space and reward me by growing quick and looking pretty. And if I'm lucky I might get it looking just as good as Trewidden's!